30 minutes from Disney, Universal & more. 2 master ensuite bedrooms, 2 twin rooms, bathroom, 2 living areas, kitchen, utility, dining, games room pool, jacuzzi & lanai. Linen & towels provided. Our comfortable villa has two relaxing indoor living areas. There is a main living room area with vaulted ceilings, large and medium sofas plus chair, flat screen TV, DVD and cable leading to a pool area. A second smaller living area is ideal for younger members of the family with a TV and console plus sofa. Wifi is available. Our full size kitchen has an American fridge freezer, rapid boil kettle for tea lovers, coffee machine, toaster and microwave. There is a dining area next to the kitchen. We have crockery and tumblers suitable for younger family members. A high chair and booster seat are available at no extra rental cost to you. The utility room holds the washing machine, dryer, iron and ironing board so this means you can pack fewer clothes for your vacation and you should have some room to take souvenirs home! We have two master en-suite bedrooms both with American king size beds. Both bedrooms have access to the pool area as well as cable TV and walk in closets. Linen is provided (bedding and towels). Each ample size bathroom also has a hairdryer to save you bringing one from home. We have two twin rooms themed for guests of any age. One is a Disney Mickey theme and one is Hawaiian or beach themed. These bedrooms share an adjoining, under the sea themed bathroom. If you find you have free time, we have a games room including table tennis and air hockey. In the main villa we also have board games, cards, some toys and jigsaws too. The pool area is fully screened and comprises a pool and a Jacuzzi spa. 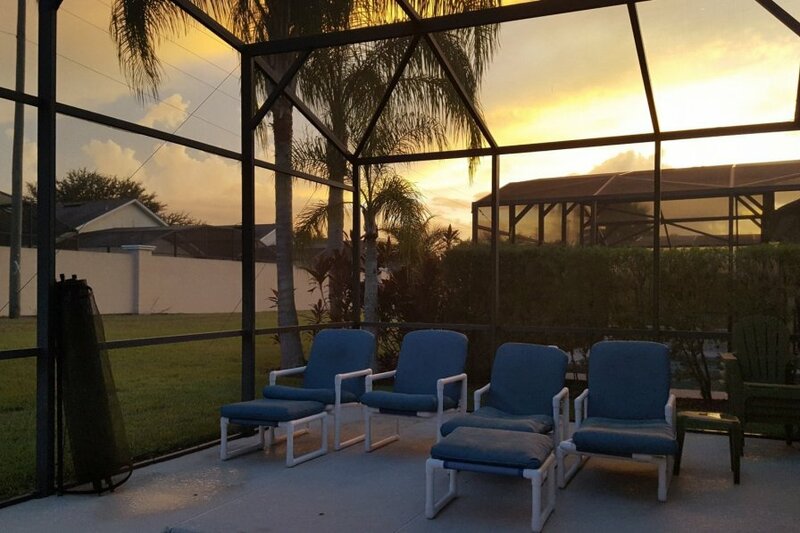 There is ample patio furniture and a lanai area ideal for sitting in the shade and enjoying a relaxing tea or coffee each morning or maybe something else in the evening! The pool can be heated if required. There are WalMart and Publix supermarkets 2 minutes away. Posner Park is 5 minutes away - there you can find Target, clothing stores such as Ross, sporting goods stores, shoe stores, beauty and more plus a cinema. All the central Florida theme parks are easily accessible. Disney is 15 minutes away, Legoland is 20 minutes away. Universal and Sea World are 35 minutes away. Beaches make a great day out so make time if you can. For sporting events nearby check out Orlando Magic (basketball), Tampa Bay Buccaneers (American football), Lakeland Flying Tigers and Tampa Bay Rays (baseball) and Orlando City and Tampa Bay Rowdies (soccer). if you have a particular interest, please let us know and we will try to assist.